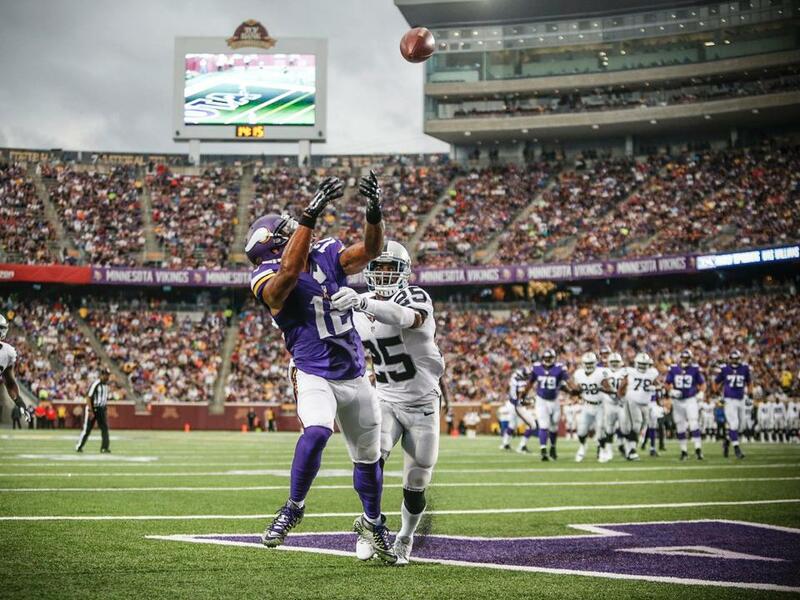 After a small delay, the Vikings weathered the storm and knocked off the Raiders 20-12. Daniel House provides his notes from last night's matchup. The weather was bad from the outset of last night's matchup with the Oakland Raiders. The players and fans were forced to evacuate the field before the game, but it still managed to start on time. However, near the middle of the second quarter, a huge lighting strike to the west of TCF Bank Stadium sparked an hour and six minute weather delay. The teams agreed to skip halftime and played through the second quarter with a two-minute break. The Vikings first-team offense was fueled by a ten-yard touchdown strike from Teddy Bridgewater to Charles Johnson. The Vikings first team defense held their own, but managed to allow a 6-play, 75-yard touchdown drive that was capped by a 2-yard score by Oakland running back Latavius Murray. The Vikings scoring plays were rounded out by a 4-yard touchdown grab by tight end Chase Ford and a 1-yard touchdown plunge by fullback Blake Renaud. As a whole, there were some good and bad moments from last night's win and I'll take you inside my notebook to learn more. In the early stages of the game, Teddy Bridgewater had some accuracy issue on several passes. He slightly overthrew a pass to Kyle Rudolph and did the same on a throw towards Jarius Wright. It's also worth noting -- Mike Wallace dropped a wide-open reception on a crossing route. However, Bridgewater still finished the night 10-for-14 with 89 yards and a touchdown. This performance included an excellent touch pass that was perfectly placed to Charles Johnson for a score. The throw and catch were equally impressive and Bridgewater certainly has established an excellent rapport with Johnson. Bridgewater has completed 78.6% of his passes in the preseason and has been doing an excellent job of going through his progressions, while displaying superior pocket presence. 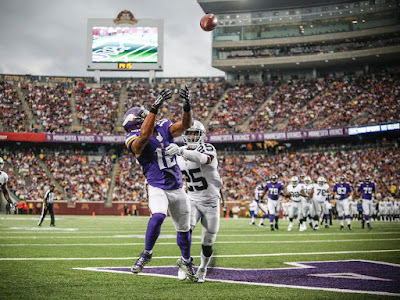 Shaun Hill threw one interception, but it was the result of a miscommunication between Hill and Cordarrelle Patterson. Taylor Heinicke entered the game and was brought to the turf on one big hit. He fumbled the ball, was injured on the play, but returned for the next series. I haven't been impressed with Jerick McKinnon in the early stages of the preseason. He has struggled to make anyone miss and is dancing way too much in the backfield. McKinnon isn't very good at running between the tackles and won't get yardage as that style of a running back. He average just 2.1 yards per carry on 12 attempts. McKinnon hauled in one nice reception when Teddy Bridgewater found him on the opposite side of the line of scrimmage. However, that was about all he could provide last night. On the other hand, Matt Asiata performed very well in his time on the field. He ran the ball twice for 15 yards and hauled in three passes for 36 yards. Asiata can gain more yardage after contact and will run the ball with a relentless edge. Jerick McKinnon hasn't been performing well, but some of it could be attributed to poor lead blocking. Nonetheless, Asiata has played better in the first three preseason game. Charles Johnson perfectly ran a fade and Teddy Bridgewater placed the pass in a spot where only he could make the catch. Johnson led the team with 40 yards receiving on four catches. It is easy to see Bridgewater likes throwing to Charles Johnson in the passing game. Johnson continues to be the one Vikings receiver that can get open against any type of coverage. Cordarrelle Patterson was involved in a miscommunication with Shaun Hill and it resulted in an interception. When Mike Zimmer was asked whether Patterson ran the wrong route, he gave a vegas answer. "Probably, if you're a betting man," Zimmer said during his post-game press conference. Patterson has continually had problems with understanding the offense and routes he needs to run. This certainly isn't encouraging for a player that appeared to be improving from this standpoint. Mike Wallace has just once catch for two yards in the preseason and dropped a crossing route in last night's game. He needs to be a vertical threat in this offense and it's unclear what has been happening with Wallace in the early stages of the preseason. Last night was the first night the Vikings were without Phil Loadholt and rookie T.J. Clemmings made his first career start. He didn't have many issues and only allowed one free rush to Teddy Bridgewater. Oakland was bringing a high volume of rushers to his side and he handled it relatively well. Joe Berger filled in for center John Sullivan who missed the game with back spasms. Berger didn't allow much interior pressure, which is very important for the players on the outside of the offensive line. Matt Kalil has held his own in the preseason and issues have been relatively nonexistent from his side of the offensive line. As a whole, the first-team offensive line performed well with a few new faces among their position group. Chase Ford got more snaps last night with MyCole Pruitt missing time to recover from an ankle sprain. Ford took advantage of the chance and hauled in five passes for 19 yards and a touchdown. He snatched a contested touchdown catch after being hit extremely hard between two defenders. Ford also corralled a one-handed grab that required some serious coordination. The road will be steep for Ford, who would only make the team if the Vikings keep four tight ends. This doesn't seem like the way it will shake out, but if the coaches like Ford's showing down the stretch, they might make it work. Justin Trattou really has flashed consistently in preseason action. Last night, he nearly intercepted a pass at the line of scrimmage and sacked Raiders quarterback Matt McGloin. Trattou has an excellent motor and closing speed. He blew across the line of scrimmage to assist linebacker Gerald Hodges on a tackle for loss. In training camp, he possessed many of the same skills on a daily basis and seems like he may be working towards an eventual roster spot. Danielle Hunter caused pressure, which led to an interception by Brian Peters. Hunter got his hand near the quarterback and forced him to make a quick throw. He still has work to do as a rusher, but his rushing angles seems to be improving each week. For the first time in the preseason, rookie Eric Kendricks started at middle linebacker. Mike Zimmer said early in the week, that the competition at this position was far from settled. Kendricks didn't really flash, but handled his assignments rather well for a young player. Gerald Hodges worked with the second team at middle linebacker and continues to show he is more disciplined than in 2014. Not to mention, he was all over the field and put his athleticism on full display. It seems he will be a rotational linebacker this year, but he certainly is making a statement. Early in the preseason, Audie Cole was working with the starters in the base 4-3 package. Last night, he worked with the third team defense. Mike Zimmer said it's important not to read too much into these decisions, but it certainly means they are trying to rotate players to find the correct mix. Early in the game, Trae Waynes was beaten badly on a double move by Andre Roberts. However, in this game, he did make one of his best coverage plays of the year thus far. Waynes perfectly leaped in front of an out pattern to knock it away. It was the first time we've seen Waynes take a chance and make a play on the ball. There are still growing pains with Trae Waynes, but he continues to show flashes as he continually progresses each week. Captain Munnerlyn is still working with the second and third team in the nickel package. Trae Waynes and Xavier Rhodes have been on the outside, with Terence Newman seeing the slot corneback reps. It's certainly is a mystery as to why this is happening. Munnerlyn said after the game he has been told he is the first team slot cornerback, but hasn't seen time with the starters. It's seems something strange is happening between the coaching staff and Captain Munnerlyn. As for last night, he had one tackle for loss and stopped the receiver dead in his tracks. Blair Walsh really left an area of concern for everyone to talk about this week. Walsh missed three kicks (all inside 50 yards) and an extra point try. The wind was heavy, but he appeared to really push these kicks as they came off his foot. Mike Zimmer wasn't happy after the game and said he was definitely concerned. The Vikings can't lose 10 points in a regular season game this year. From a statistical standpoint, Walsh was the most inaccurate kicker in the league in 2014. Walsh said he worked hard to be more consistent in the off-season. However, it hasn't showed in the preseason and he is now 2-for-6 on field goals tries in exhibition contests. He needs to solve this issue quickly before the regular season begins. I might as well copy and paste the same comment because there is one word to describe your work and that is the word, AWESOME!!! !